Make sure to mark your calendars for 2019's Quilters Quest Shop Hop! 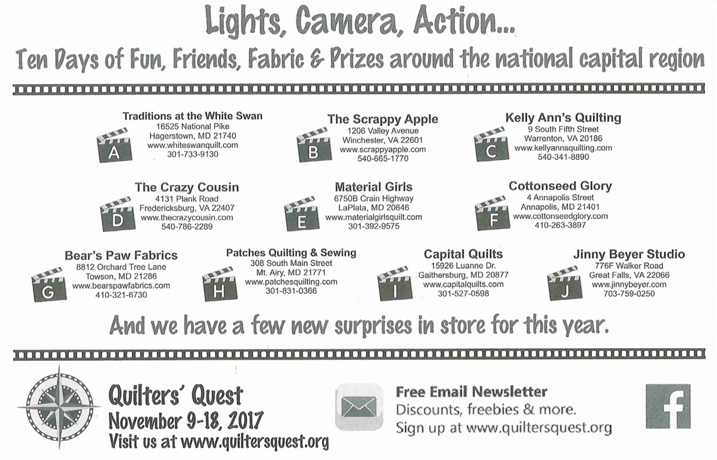 Quilters’ Quest is a free event that encourages quilters to explore 9 quilt shops in Maryland and Northern Virginia over the course of 10 days. Head on over to Quilters Quest for more details, and get signed up for the monthly newsletter that will give you exclusive details about quest from free patterns, first-looks, coupons and much more! P.S... Did you know that when you get your passport stamped at all 9 shops during quest, you will receive a finishing card that will entitle you to receive a 15% discount on regularly priced merchandise (some exclusions apply) at the participating shops throughout the following year? Leave the driving to us, and sign up for our bus! We will have 2 buses participating in Quilters Quest this year. One bus will run on Wednesday, October 24th, and Thursday, October 25th. The second will be on Friday, October 26th, and Saturday, October 27th. We will leave Traditions between 7:00am and 7:15am; we will spend the night at a Hilton Garden Inn in Waldorf, MD. We plan to have around 45 minutes in each shop to visit and make your purchases. We request that you pack a lunch for the first day of your trip; we will then stop and have a nice dinner. On the second day of our trip, lunch will be in Warrenton, Virginia. There are a couple options close to Kelly Ann's Quilting shop. The cost for the trip is $195, double occupancy; this includes bus trip and hotel with breakfast. A deposit of $50 is required to hold your spot; it will be refundable until October 1st. After October 1st, there will be no refunds. The balance for the bus trip will be due October 1, 2016. Note - our Wednesday/Thursday bus is full at this time. We can offer a waitlist in case of cancellation. The trip price includes charter bus to and from each of the 9 shops, leaving at approximately at 7:00 am. We will visit 5 shops the first day, and then check in to the hotel at Hilton Garden Inn in Waldorf, MD for the night. We plan to have around 45 minutes in each shop to visit and make your purchases. We request that you pack a lunch for the first day of your trip; we will then stop and have a nice dinner. On the second day of our trip, we will make a quick stop at a fast food restaurant. A free continental breakfast is provided at the hotel before our departure on the second day. We will then visit the 5 remaining shops before returning to Traditions at the White Swan in Hagerstown, MD at approximately 6:00pm.